Rajesh Koothrappali: You can’t just fund your own project. Leonard Hofstadter: Uh, it turns out I can, and I did. Sheldon Cooper: Interesting. What about not wanting everybody to be mad at you? Leonard Hofstadter: Well, I realized that, no matter what decision I made, people were gonna be mad at me. And this way, I get a laser. Sheldon Cooper: That is the most selfish thing you’ve ever done. I’m proud of you. 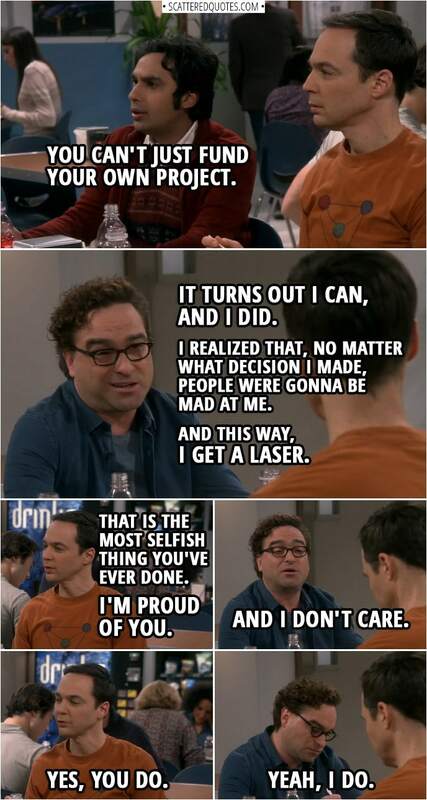 Leonard Hofstadter: And I don’t care. Sheldon Cooper: Yes, you do. Leonard Hofstadter: Yeah, I do. 3.2.2019 This way, I get a laser.